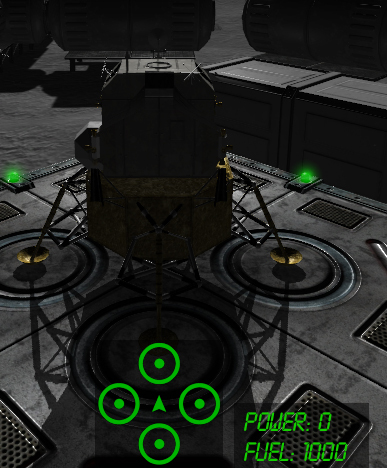 Lunar Flight is a part of this awesome bundle of Space Based fun! 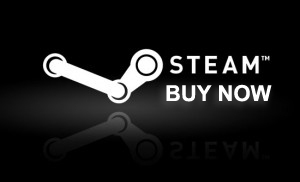 Steam Sale Extended Until June 2nd – 75% Off! The Steam sale has been extended to be apart of the Because We May promotion. Take the opportunity to get Lunar Flight at the crazy price right now, maybe buy some copies for your friends… your friends will love you for it! Most of Scott Manley’s videos are normally about Kerbal Space Program which I really encourage you to check out if you haven’t already! I really liked his videos and asked if he would take a look at Lunar Flight which he did and created this great video review. ON SALE – 75% OFF UNTIL 25TH MAY! 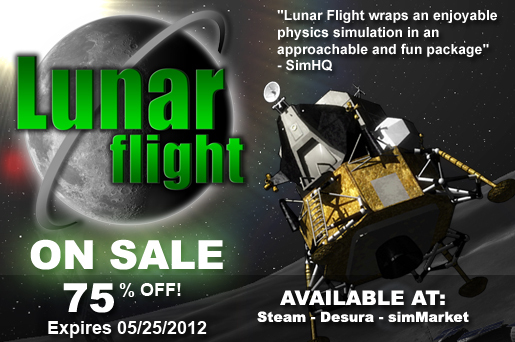 We’re running a promotional sale right now for 1 week you can buy Lunar Flight at 75% off the normal price. That’s a mere $2.50 and less than the costs of a good cup of coffee. 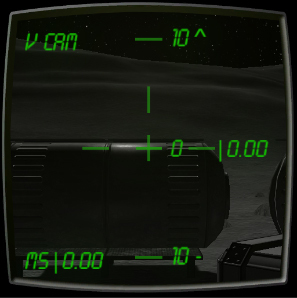 There’s never been a better time to get the game and experience what many gamers have already discovered that Lunar Flight offers a unique, challenging and deeply immersive simulation unlike anything before it. The latest update is now available on Steam, Desura & Gamers Gate. The update features some nice new additions, polish and some bug fixes. You can now Delete profiles and a small window displays the basic info about the selected profile. 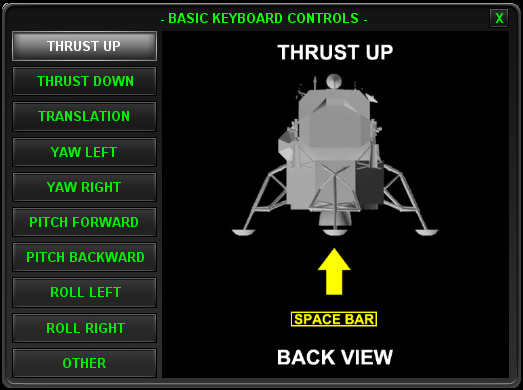 When starting a new profile the Basic Keyboard Controls window will display when you first enter the game. It can also be accessed via the Main Menu. The Velocity camera has been modified and it now shows the current ascent/descent angle. It can also be used check your pitch angle when it is within 20 degrees of the velocity vector. These were added to make flying from these views easier, particularly since you can now see how much fuel you have remaining. New buttons have been added in the top right corner for selecting the primary camera modes. 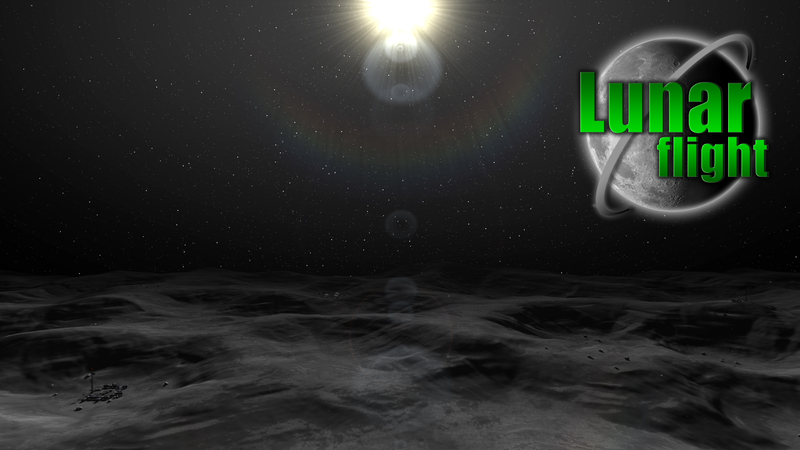 Sean appeared on the Return Fire Podcast last week to talk to Mike, Alex & Ade about all things Lunar Flight, Indie games development and bunch of other stuff. So here’s one I whipped up in 1080p, Click on the image to open the full sized version so you can save it. Well the time has come to make the Logo look a bit more professional. I’ve known for awhile that the old design was perceived as amateurish so I got to work on this new one. I wanted to keep the ‘green’ aesthetic I hope you like it… I’ve also been cleaning up the front page and reducing the clutter as well as conforming all uses of the Logo’s to the new designs on the Forum and Facebook. Here’s the sales graph since release, as you can see it’s had quite a drop off. I’ve indicated key events that signify a variation in the average sales. While the initial sales have been ok, if the current average declines anymore it will not be enough to sustain full time development and any significant content additions to the game. It’s still quite early to know how it will perform hidden away on the Simulations page of Steam. There are future Media coverages and Steam sales to happen so we’ll have to wait and see how this goes. One thing to consider is that after Valves cut and tax I will end up with around %50 or less of the revenue. This post generated a lot of interest and traffic, I want to make one thing clear is that I am not ‘Abandoning’ the game as some people have suggested. It has been a labour of love for me and it’s something I have invested a lot into. I want to see the game continue to be improved and I will continue to release ongoing updates. When I say ‘Significant Content Updates’ I’m talking about something that would require months of development time to do. Adding new game modes etc… I still have intention of doing that stuff but the speed at which I could produce new content will be a lot slower if I am unable to work on it full time.